(L-R) Carolyn Hennesy as Mother Superior and Sabrina Kern as Mary in the horror film, ‘St. Agatha,’ an Uncork’d Entertainment release. Photo courtesy of Uncork’d Entertainment. Uncovering the unwavering strength needed to escape a difficult situation can be a challenging process for anyone, no matter what emotional and physical obstacles they have already endured. That’s certainly the case for actresses Sabrina Kern and Carolyn Hennesy’s distinctly different protagonist and antagonist in the new horror movie, ‘St. Agatha.’ The drama, which is the latest intriguing entry in the nunsploitation subgenre, explores how two completely different women can have such diverse interactions with their religion, which leads them to transform into such distinct people. While they have both endured heartbreakingly painful circumstances, the varying levels of courage they both possess, as a result of their faith, lead them down drastically various paths. ‘St. Agatha’ was directed by acclaimed horror filmmaker, Darren Lynn Bousman, who has also helmed such classics as the second, third and fourth installments of the ‘Saw’ series, as well as ‘Alleluia! The Devil’s Carnival.’ His latest contribution to the genre is being released today in theaters and On Demand and Digital HD by Uncork’d Entertainment. The events of ‘St. Agatha’ switch between Mary’s (Kern) present day in 1957 in rural Georgia and the past year, during which time she becomes pregnant by her boyfriend, petty criminal-musician, Jimmy (Justin Miles). Having to go out on the road to make money, Jimmy is reluctantly forced to leave Mary behind in their small town after she tells him that she doesn’t want to travel while she’s pregnant. In desperation to protect and held their unborn child, Mary then accepts the help of a nun she meets at a soup kitchen, and heads to the isolated Sisters of Divinity convent. When she arrives at the battered home, Marry’s taken in by the officious Mother Superior (Hennesy) and the nuns who work for her. After arriving at the convent, Mary almost immediately realizes that it’s not at all what she expected. 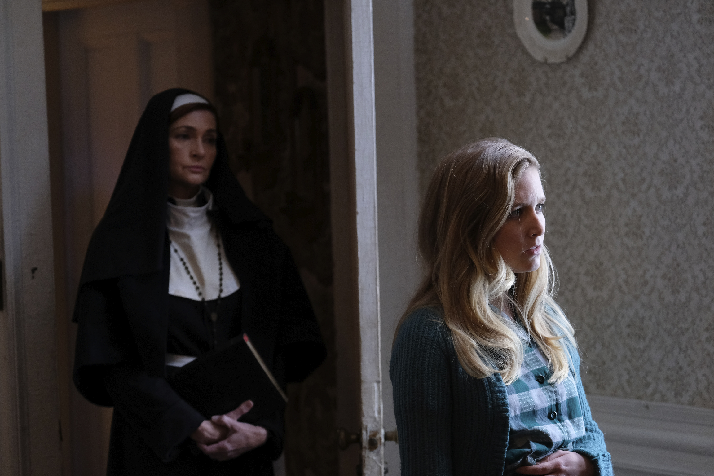 Mary initially presumes that the convent would be a safe haven for her until Jimmy returns home and they can start their family life together. But she quickly discovers that she and and the other young expectant mothers who were taken in are actually being held against their will, and the convent acts as a prison that thrives on Mother Superior and her nuns emotionally and physically torturing the other young women. While she doesn’t have anywhere else to go until Jimmy returns home for her, as her abusive father (Jayson Warner Smith) still blames her for the accidental death of her young brother, William (Maximus Murrah), Mary remains determined to stop Mother Superior once and for all, and leave the convent to raise her child. Kern and Hennesy generously took the time recently to talk about starring in ‘St. Agatha’ during individual exclusive [hone interviews. Among other things, the actresses discussed that they were drawn to play their respective characters in the drama in part because of Bousman’s powerful directorial style in the horror genre. The performers also explained how they both appreciated having the chance to explore the emotions and motivations of such strong, but opposite, characters, and how their quickly deteriorating relationship influences them to take whatever means necessary to get what they want.